Want to know what to expect in basic training? There’s an app for that. The Air Force has a new iPhone application to help would-be airman learn more about physical training and what they can expect out of life in the service. The free app is available for download at the iTunes store as of June 2. A similar app will be available in the Android market in early July, according to Air Education and Training Command. The Air Force apparently got the inspiration for the app from the Army’s Future Soldier Training System. by General Dynamics Information Technology created the app for AETC. “The application will help Air Force candidates prepare for basic military training and ensure they arrive in better physical condition,” said Maj. Sandra Magaña, Air Education and Training Command, chief of future learning capabilities in an Air Force article. 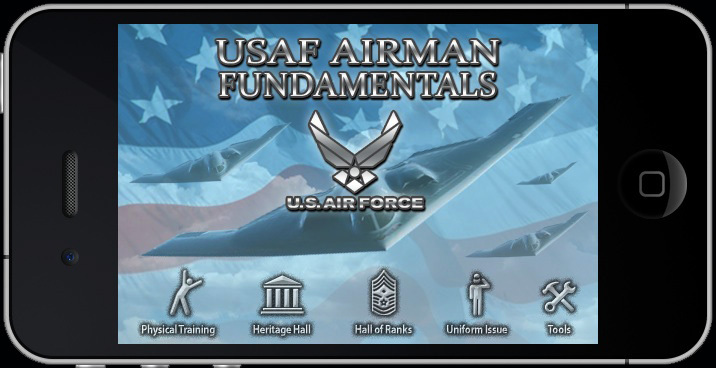 Air Force Airmen Fundamentals iPod interface image of mobile phone app. The app includes links to information and videos on running techniques, the correct way to perform sit ups, push ups and pull ups. Users also can link to the Air Force’s Basic Military Training website to access a 14-week workout schedule. Other segments include a Heritage Hall to learn the Airman’s Creed, the Air Force song and core values. The Hall of Ranks has enlisted and officer ranks with insignias and a game to help learn instant recognition. The Uniform Issue segment has information and photos of the Airman Battlefield Uniform, physical training uniform, service, and service dress uniforms. To download the free iTunes app, go to http://phobos.apple.com/WebObjects/MZStore.woa/wa/storeFront. Please design an application for iPad that enables the AF times subscriber the ability to download digital issues of AF times that I can read without WIFI connection. The convenience of a news paper that can be read anytime or anywhere combined with the convenience of my ipad.